Cadets place the memorial wreath at the Pylons for Veterans Day. The Virginia Tech Corps of Cadets will honor Veterans Day and the service of our nation’s military through a series of events on Nov. 12. A Veterans Day remembrance ceremony begins at 10:30 a.m. in the War Memorial Chapel at 601 Drillfield Drive. U.S. Navy Capt. Jim Snyder (retired), the deputy commandant for the corps’ 2nd Battalion, will speak. That afternoon, volunteers from the student organization Veterans @ VT will take turns reading the names of those killed while supporting Operation Enduring Freedom, Operation Iraqi Freedom, and Operation New Dawn. It is expected to take more than five hours to read the names of the more than 6,800 men and women who lost their lives in the conflicts. At 4:45 p.m., the corps will hold a formal retreat ceremony on Upper Quad. The Color Guard will lower the flag; Skipper, the Corps of Cadets cannon, will be fired; and the Highty-Tighties, the regimental band, will play. Two vigils also will honor veterans. 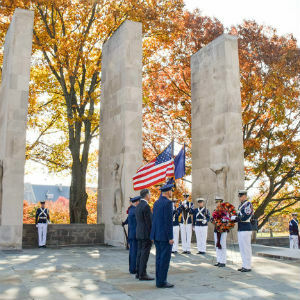 The Air Force ROTC’s Robert Femoyer Service Squadron will hold a 24-hour vigil at the Rock — a memorial to Virginia Tech alumni lost in World War I — on Upper Quad starting at midnight Nov. 12. Two cadets will be posted as guards and will change every half-hour. Volunteers from the corps and the Air Force ROTC will participate. The Corps of Cadets’ Echo Company will hold a vigil from midnight Nov. 12 to midnight Nov. 14 at War Memorial Court. Two cadets will be posted as guards at the cenotaph and will change every hour for 48 hours. Echo Company will gather at midnight Nov. 14 at the Pylons to commemorate the vigil’s conclusion. Additionally, on Nov. 10, cadets from the corps’ Citizen-Leader Track, as well as the Highty-Tighties, the color guard, and the precision drill team Gregory Guard, will march in the Virginia’s Veterans Parade in Roanoke. The parade will start at 11 a.m. The week before Veterans Day, the Corps of Cadets will thank university employees who served in the military with a commemorative coin and special invitation to the university’s Veterans Day events.